Greetings, Greasaholics and Ninomaniacs, and welcome to the Born Bulky comics series! 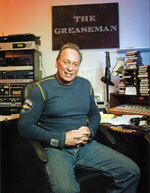 This portion of Greaseman.org is brought to you by Joe Hollingsworth of HEAD'S UP PRODUCTIONS in Westminster, MD. I would like to thank Steve for providing the forum of Greaseman.org to showcase the Born Bulky series. It has been a longtime dream of mine to produce this series. Over the years, there's been numerous obstacles thrown in the way of the Born Bulky comics. I've had to take a lot of detours to get around these roadblocks. The Internet has become the new venue for the display of many new comics creations. Born Bulky now takes it's place among the great comics series appearing on the net. Since it's debut on Greaseman.org, Born Bulky has generated an influx of e-mails from the core of fans of the ring-dang-do. Many of these e-mails had one FAQ: How can Born Bulky be obtained in print? Right now, efforts are underway to bring Born Bulky to the comic book outlets. Since February 2002, Head's Up Production has been casting about for an independant comic book publisher to bring the series to print. It's an uphill climb, yet the quest continues. I hope to know something soon. Joe always enjoys hearing your thoughts about his work, so e-mail your feedback to him at headsupcomic@netscape.net. There's more info about Joe, his Heads Up Productions, and full contact info at the bottom of this page. But first, let's get to the comics! The fifth release in the Sgt. Fury 2001 series. Three episodes, featuring: The Audit, Bin Laden Bombz Again & Osama Goes To Hell. 18 pages. Sgt. Fury 2001 #6 (2005) The sixth release in the Sgt. Fury 2001 series. Five episodes, featuring: Cooking With The Hydraulics, Osama's Big Deal, Mission Accomplished, Adios Afghanistan, Operation Homecoming & 2 cartoons. 20 pages.